Only this time on my local bus. Following on from our post on pointless station signs, here is one I saw this morning. 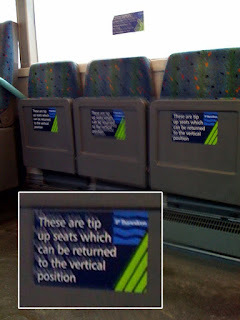 Now just in case you can't read it (click on the image to make it bigger), the sign says 'These are tip up seats which can be returned to the vertical position'. We know that, they're already in the vertical position! And when they're not vertical you can't see the sign! Why not say 'These are pull down seats'. Simple.